Handfasting, hand tying or ‘tying the knot’ is an ancient Celtic marriage ritual. The celebrant ties ribbons around your joined hands as a way of confirming your union. 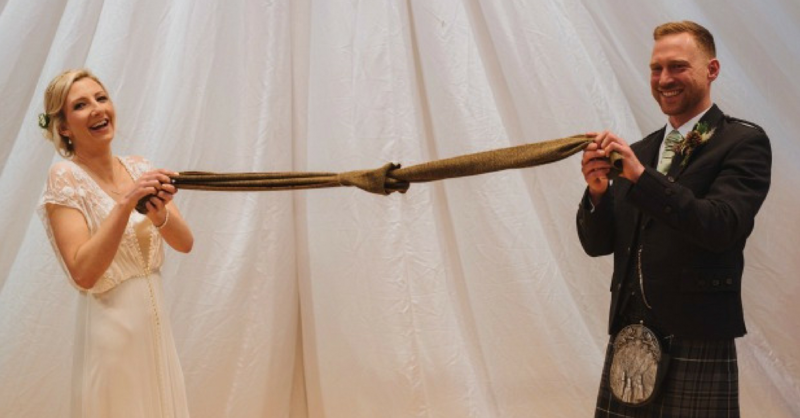 Hand fasting is an ancient Celtic marriage ritual and it is where the expression ‘tying the knot’ came from! It is a symbolic way of showing that you are joined to one another and although originally, the idea was that they be betrothed for a year and a day a hand fast during a legal wedding will be for life. You can also do a family handfasting and involve your family members – this is often done with young children, and is a lovely way of involving them in your ceremony. 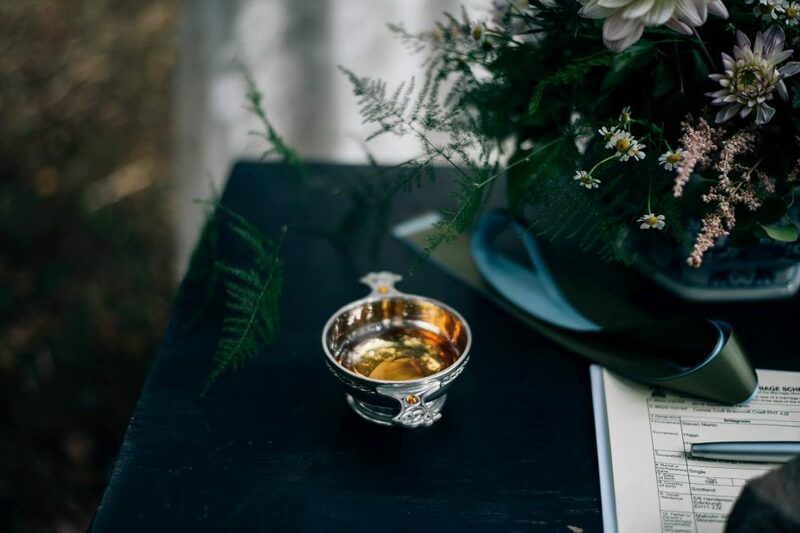 Drinking from a Quaich is an ancient Scottish ceremony, symbolic of trust, love and peace between two people. This act of sharing is a symbolic of the life you will share together, and the cup represents the cup of life. In drinking from the same cup, you are symbolizing your commitment to share all that the future may bring. All the sweetness life’s cup may hold should only be sweeter because you drink it together. And whatever bitterness it may contain should be less bitter because you share it together. This is traditionally done with whisky but you are welcome to choose a drink of your choice and create your own special drink (alcoholic or not). A wedding band warming is a lovely way to involve all of your guests at the ceremony. This is where the wedding rings get passed round all the guests (usually tied on a ribbon or on a ring cushion) as the ceremony is taking place so that everyone gets to ‘warm the rings’ and add their own thoughts, wishes and hopes for your marriage. They are passed round (usually monitored by a reliable member of the wedding party) until they make their way back to the front in time for the vows. A Unity Candle is a symbolic way of showing the joining of 2 individuals on your wedding day. You will light two candles to symbolise your identity as two individuals. This is usually done before the vows. After the vows you would light a third candle – although you are still individuals, you are also then as one and from the two candles they light a third to recognise your union together. This is an adaptation an old African-American tradition to jump over a broom on your wedding day. The broom symbolises the sweeping away of the past and the fact that you are now starting a new life together – as a happy married couple! An Oathing Stone is an old Scottish tradition where you place your hands upon a stone while saying your wedding vows. It was thought to be the best way to express your solemn promise in physical form. This ancient ceremony is rooted deeply in the Celtic tribal traditions. Having a connection to your ancestors and the land was a critical ingredient to any important new venture – particularly, marriage. The oathing stone helps root your future into the wisdom of the past at the start of your new life. A Sand Ceremony is a unique way to symbolize two lives becoming one. The two separate bottles of sand represent your single lives, separate families and separate friends and your lives before your wedding day. Two containers of sand are poured into one container, the individual containers will no longer exist, but will be joined together as one. Just as the grains of sand can never be separated, neither will you in your married life. This can be done with sand from significant beaches/areas in your lives or with different colours of sand too. There is also a variant where you use different sizes of stones to represent the challenges you will take on together through your married life, big stones for the large events in life are placed into a jar until it is full. Smaller pebbles to symbolise those moments which may be less important but are still significant, will fill in the gaps around the larger stones until the jar again seems full. Then sand is poured in to symbolise all those small steps you take together each day. The sand fills in the rest of the gaps. This symbolises that while you may look back on your life together and see those big events, it is all the little kind gestures and support you give each other along the way that shore up and support you through the bigger challenges.